Fooled you…? – Maybe you guessed it: Our promotion for the new SOURCE Taste Edition on April 1 was not for real. What’s 100% true for all SOURCE Hydration Systems: Water tastes better than from any other bladder – because water from SOURCE Hydration Systems tastes like water and nothing else. SOURCE Taste Edition – Fooled You? Never say never, but this SOURCE Taste Edition we launched on April 1 will most probably never hit the shelves. It was not a product idea we passed on to our developers – but to our Social Media folks for April 1. What’s true and always will be true: Drinking from SOURCE Hydration Systems tastes better than from any other. And there’s good reasons for that: The smoother GlassLike film, our GrungeGuard Technology and more (read: What Makes SOURCE Hydration Systems Better Bladders). And we WILL keep developing new systems like the D|Vide, the hugely successful 2015 launch where you get two drinks in one hydration system. Ideal for flavored/isotonic drink and pure water taste on the road (more: New 2015 Hydration Systems & Packs). The D|Vide was awarded with a Design & Innovation Award from Enduro Magazine 2015. 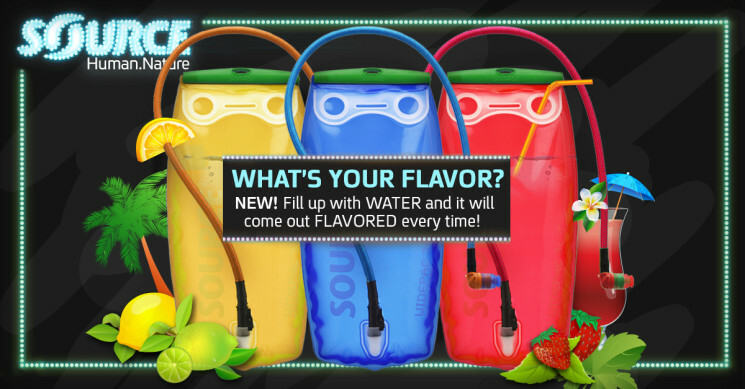 Check out the full selection of SOURCE Hydration Systems here on SourceOutdoor.com – and get ready for the outdoor season 2015!